You are here: Home / Skincare / Why Clean Linens Matter! There is nothing like warm clean linens! The smell of them as they come out of the dryer, cuddling them to your chest. When it comes to your skin and health it is important to have clean linens. The more frequently your change your linens the better. I recommend at least twice a week. Three times a week or more if you have oily skin, acne, or night sweats. Your linens harbor bodily secretions (sebum, sweat, blood, et cetera), bacteria, skincare products and cosmetics that can aggravate your skin. Your linens also accumulate dead skin cells, animal hair & dander, fungal mold, fungal spores, dust, pollen, dirt, and food. This can irritate your allergies and asthma and invite unwelcomed guests into your bed, such as mites. 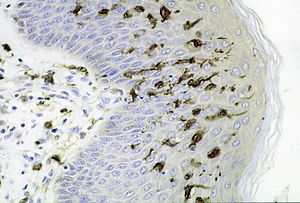 Section of skin showing large numbers of dendritic (Langerhans) cells in the epidermis. « Fun at the IECSC and IBS Tradeshow in New York!